Mars on March 3 at 8 p.m. local time as seen from mid-northern latitudes. The planet Venus has attracted considerable attention in recent weeks in our predawn morning sky. But what ever became of the planet that glowed like a brilliant yellow-orange lamp late last year as it made a close approach to the Earth? That planet-Mars-is still visible in our evening sky, but it continues to fade in brightness. 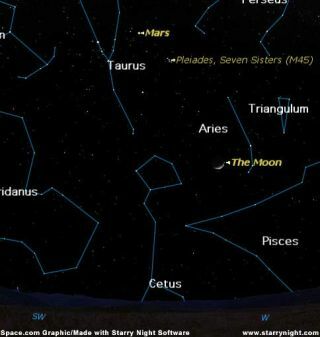 This week you can find Mars among the stars of Taurus, the Bull, shining almost midway between the distinctive V-shaped Hyades and the Pleiades star clusters. Currently, it's about 121 million miles (192 million kilometers) from Earth and shining at a magnitude of +0.7. That's just a trifle brighter than Altair, the twelfth brightest star in the sky; a very respectable position in terms of stellar brightness. Still, it's also a tremendous come-down from last Halloween, when Mars ranked as the third brightest object in the night sky, next to the Moon and Venus. In fact, this topaz-tinted world now only appears 1/16 as bright as it did 4 months ago. Late on Sunday evening, March 5, you'll see Mars dropping down the west-northwest sky side-by-side with a fat crescent Moon. Drifting eastward, it will pass 7 degrees north of Aldebaran on the 10th (the width of your fist held at arm's length is roughly equal to 10 degrees). Compare the brightness and color of this 0.9-magnitude orange star with Mars, which also shines with an orange hue and whose predicted brightness on that night should be the same as the star. But make no mistake about it, Mars currently appears dim in comparison to what it was last fall and sadly it will only get dimmer in the weeks to come. One month from now, for instance, it will have receded to 143 million miles (229 million kilometers) from Earth and will have dimmed further to magnitude 1.1 (about as bright as the star Pollux in Gemini). Mars is also rather disappointing in telescopes as its apparent diameter shrinks as Earth continues to pull ahead of it in orbit around the Sun. It's apparent size as seen through telescopes is only about 36 percent of what it was back at the end of last October: just 7.2 arc seconds in width. Put another way, you would need an eyepiece that magnifies approximately 250 power to make Mars appear as large as the Moon does with your unaided eye. You would need at least a six-inch telescope to adequately enlarge Mars to this size. Unfortunately, most novice observers have small telescopes where such a magnification is not recommended because it would only serve to make the image appear rather dim and fuzzy. Mars doesn't even appear as a full disk at the present time; the angle of illumination between Mars, Earth and Sun makes it appear more like a gibbous Moon, about 89 percent illuminated. During the next several weeks, Mars will be setting roughly between 12:30 to 1:00 a.m. Although getting progressively dimmer, Mars will still do a pretty good job of staying well ahead of the Sun through about mid-spring. But during June it will begin sliding more rapidly toward the Sun's vicinity, eventually setting before the end of evening twilight by the end of the first week in July. Along the way it flirts with Saturn, passing only ½ degree to the north of the ringed beauty on the evening of June 17. Just over a week later on June 25 Mars will reach the aphelion part of its orbit, placing it at its greatest distance from the Sun: a distance of nearly 155 million miles (249 million kilometers). Mars will continue to fade as it gets farther away from the Earth through the balance of spring and into early summer. Eventually, sometime during mid July it will become so deeply immersed in the bright evening twilight, so as to be rendered completely invisible. By then it will also be at its absolute faintest magnitude of +1.8, putting it in the rank of second-magnitude stars. Finally, on Oct. 23, it will be on the other side of the Sun as seen from our Earthly vantagepoint, at solar conjunction at a distance of 241 million miles (387 million kilometers), putting an end to the best apparition of Mars that we will see until the year 2020.